Until 8th May 2019, enjoy a $50 on your total order when you purchase 2 x R270i on Lazada! The R270i is SuperSolid’s advanced gaming monitor that checks all the right boxes. Traditionally, high refresh rate monitors were synonymous with TN panels, but TN panels sport poorer colour reproduction and viewing angles. If you wanted great colour, you’d have to choose an IPS panel, but these come at the expense of lower refresh rates. 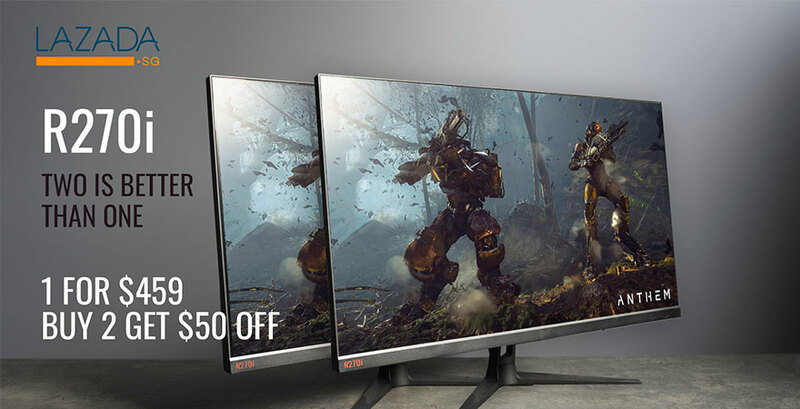 Enter the SuperSolid R270i – with its 27-inch WQHD (2560 x 1440), 144Hz IPS panel, say goodbye to the traditional trade-off between colour and refresh rate! Get the best of both worlds now and grab one for $459, or make things even better and get 2 units on Lazada, and we’ll throw in a $50 discount on your total order! Just follow this link to get one step closer to gaming nirvana.